Yesterday I took Elizabeth to the local community centre for an activity called "Family Fun Time". We went with my new friends (!!) Ignacia and Javiera. Ignacia has a four-year old son Francisco and twin daughters Olivia and Florencia, who are 18 months. Javiera's son Manuel is three, and she is expecting her second son in March. Elizabeth is a lot younger than these kids, but totally loves playing with them.Well, mostly they play, and she crawls among them and randomly picks up a toy to eat. But she laughs and giggles a lot. We went to a music class with Javiera and Manuel, and for the first half-hour, Manuel would put a bell or a tambourine about 5 feet in front of Elizabeth and she would giggle and crawl to it, and then he'd run ahead and put down another instrument and she would crawl to it, and giggle more. It was ridiculously cute. 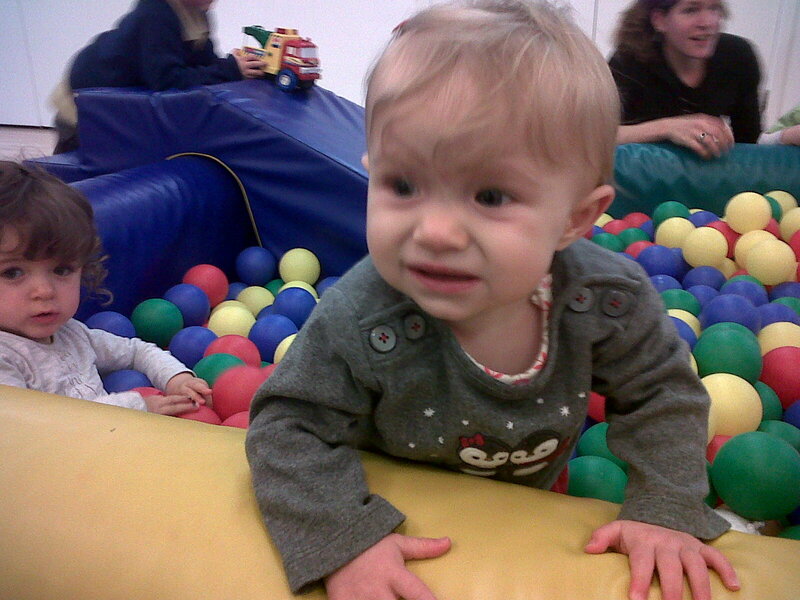 Leah gave me a similar look when I put her in the ball pool as well. I think it was a little to overwhelming for her. The look on E's face is priceless though. That "Georgina" look "Are you completely out of your mind? This place is full of round slippery things. Did you honestly think I would find falling over is fun? Mothers, I tell you...! I'm going to scream if you don't fix this right now!". I don't suppose you went into the pool to show her how dangerous I mean fun it is. Minus 1 for Mummy skills. Just kidding - honest injun (no ethnic offense intended, just a kid's proof of total trustworthiness). Stay happy and wear a cycle helmet (and, putting safety beyond fashion (true anorak road warrior) wear armoured gauntlets that extend over your cuffs and wrists, elbow, knee, shin, shoulder, back and neck protectors and reflective conspicuity tape every where). You have to think "I am so a Volvo cyclist". On the roads, (motor)bikers and cyclists are invisible to motorists so never ride faster than your guardian angel can fly. Love and hugs to all, Jenni. PS great blog and pictures.